We put in below the whitewater section. Hickory Creek enters from river right. Be sure to nose into the creek and see how it runs over broad smooth bedrock. 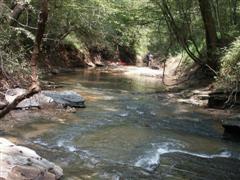 This is a beautiful section of river with plenty of rocks to sun on and lots of wildlife. The takeout is just before the business 220 bridge on river left.